It's summer and your fruit share is full to bursting. What to do? Get yourself a bucket of vanilla ice cream, and let contributer Cara Valla, sous chef at San Francisco's Chiaroscuro, show you the way to some fantastical fruit toppings. Pre-heat your grill to medium. Quarter your peaches and dress with a little olive oil and salt. 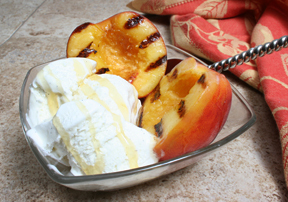 If your grill has larger slats, simply make a bed of tin foil to hold up your peachy goodness. Once the fruit is on the grill, let it get some color and soften up. Remove when soft and lay over vanilla ice cream. Top with your choice of toasted almonds or crushed amaretti - or just enjoy the simplicity of warm peaches and cream. Clean and quarter your strawberries. Dust with a little sugar to get the juices flowing. Drizzle on a little of your favorite aged balsamic vinegar. Rip up the basil leaves and toss with the fruit. This topping is amazing on vanilla ice cream or brownies. Yum yum! ny tips on how to get the pit out of the peach without mangling it like I tend to do? Great question! I think it has so much to do with the level of ripeness of your peach. Does anybody have grapefruit spoons anymore? Those seem like just the right size and shape to do the job. Good idea on the grapefruit spoons! I asked Cara and she says the only trick is to cut down the meridian, and then twist the halves apart. Sounds like a plan to me!